Photos Of, Or List Of, The Different Colors. 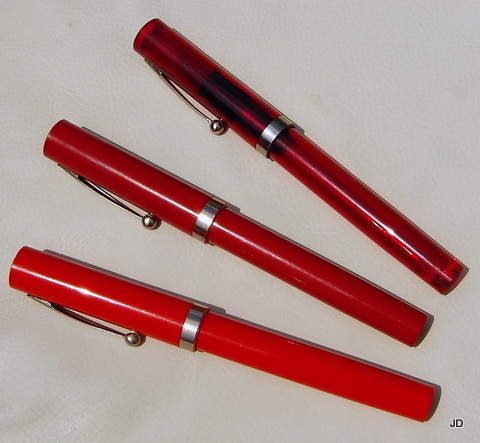 I realize that the Sheaffer NoNonsense is not the most revered or sought after pen but I do collect them. I have never seen a photo, catalog or list of the different colors that were produced. The ads and sports and Disney pens(etc etc) I have no interest in. I collect only solid or marbled versions. Has anyone ever seen or heard of, a photo or list? Any useful information would be appreciated. 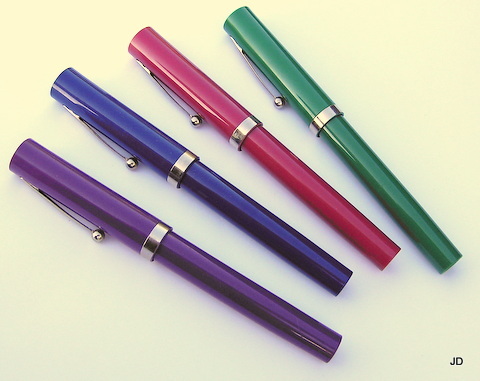 I've never seen a list and have given away most of my NoNonsense pens but there were clear red, blue and green as well as marbled red, blue and green and solid black. There are also the upscale versions that were sold as "For the Guy" and "For the Gal" in orange, lime and red and the "Old Timer?" that was engraved. That would probably be a rather exhaustive list; I've never seen one, but I image we can pool our collective experience here to create one. From personal contact, leaving aside the goofy variants, there's black, white, red, blue, green, and brown in solid colours, plus the "Vintage" blue, green and red marbles, and I might be rules-lawyer enough to mention the Stainless variant as well. I won't speculate on other colours... but I'll bet there's more. I would also not be surprised to find one of us IS a dedicated collector of No Nonsenses, and will provide the sought-for picture(s). EDIT to respond to stuff that appeared while I was typing: Did clear bodies appear in the No Nonsenses? I thought that was an innovation with the Viewpoints. Edited by Ernst Bitterman, 17 April 2012 - 21:54. I will attempt a new photo of the NoNonsense pens that I have, but I have yet to produce a photo of these pens that "works". I have seen clear bodied old style Nononsenses on the bay a few times. 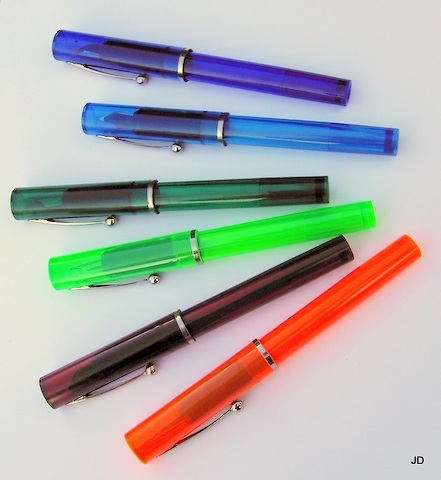 Yup, I still have some of the clear colored bodied NoNonsense pens and last year gave about a dozen to a school class. I love Nononsense coloured demonstrators. Probably among my favourite pens. 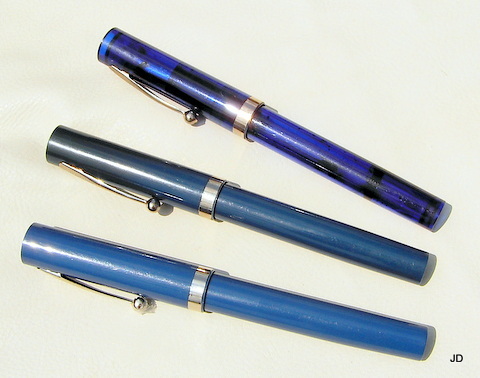 Among my Sheaffers, I must say that the NoNonsenses are probably among the best writers despite their plain steel nibs. Here is my best effort at a photo of the clear colorless, chrome plastic with no band and a brushed metal. Edited by jd50ae, 19 April 2012 - 20:04. I am fascinated to learn of transparent No Nonsenses. My new thing for the day! Edited by Ernst Bitterman, 19 April 2012 - 19:14. 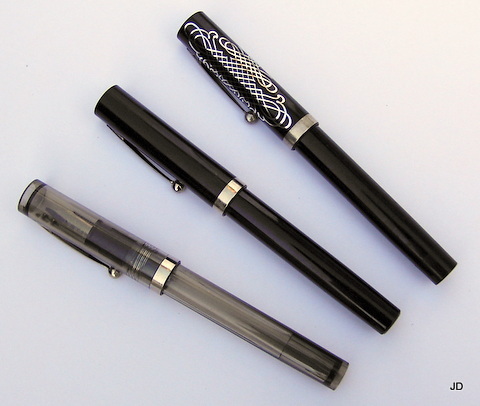 These 4 pens have silver furniture and a silver button in the cap and come with standard nibs, not the calligraphy nibs. I also have 3 pens (missing the purple) with gold furniture, standard gold nibs and a gold button in the cap. They are also marbled and seem to be a darker shade. Edited by jd50ae, 19 April 2012 - 20:13. Sure I have seen a post probably a couple of years back that listed lots more colours. 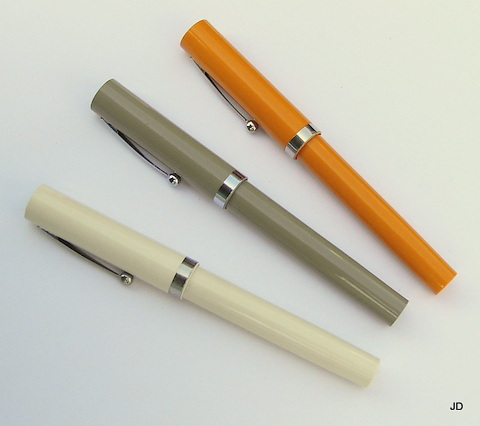 I have sets of all 3 vintage colours, 3 sets of demo colours, red, blue, green, black and white in solids (in fact several whites) and a stainless steel one. Thing I love about these is that the RBs/BPs can easily be converted to FPs if you find them in a colour that you can't find the FP in (taking out the spring in the bottom of the barrel is optional). They can also be converted to Eye droppers if you want. Nibs are relatively easy to come by and there seem to be lots of Italic ones around where people have split up sets. Oh and they write well too. Edited by andyk, 19 April 2012 - 20:36. The marbled pens with gold trim would be the Vintage series. I believe the basic No Nonsense pens have chrome plated trim. I have no clue what other colours might be available. 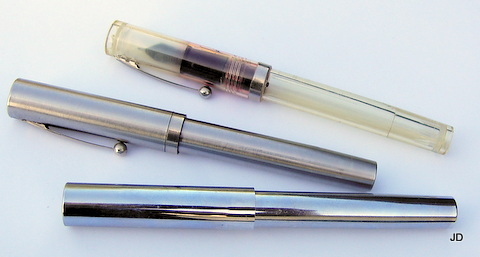 Love that clear demonstrator version. Anyone have a sense for how rare and/or hard to find they are? I'm on an eyedropper kick of late. Edited by Scribero ergo sum, 20 April 2012 - 03:53. These are the 3 black versions I have. Have not been lucky enough to snag an "Old Timer" yet. One of these is obviously white. I think the middle one is beige. The last one is neither yellow or orange, something in between. Obviously three blues. I had actually put one of the solid blues in "swap or sell" mode until I saw it in a better light while taking these photos. 2 red and one orange. The orange was very hard to capture. So far I have posted only wide band pens but I thought these warranted at least an honorable mention. I will not bring up anything but the older wide band pens again. These will sooner or later be moved to my "swap or sell" drawer. These also have snap caps. I believe these are referred to as "jellys". These are in my "swap or sell" drawer, soon to be joined by the narrow band "jellys" pictured above. So, if you see something you are interested in let me know.